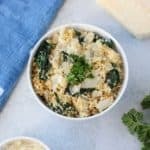 This Parmesan spinach couscous is a quick and delicious side dish made with a handful of pantry staples. It can be prepared in just 20 minutes. Serve it as a side dish with your favorite protein or eat is as a vegetarian main dish! In a large saucepan, heat 1 tablespoon of olive oil and add the onion. Cook over medium heat for 10 minutes or until the onion is soft and translucent. Add the garlic and continue to cook for 1 minute until fragrant. In a separate pot, bring the water to a boil. Add couscous and remaining tablespoon of olive oil. Stir then immediately remove from heat and cover. Let the couscous sit for 5 minutes then fluff with a fork once the water has been absorbed. Add the couscous, salt, parmesan cheese, and spinach to the onion and garlic. Cook for 5 minutes over medium heat, until the spinach wilts slightly. Add salt to taste and serve immediately. Add additional parmesan, if desired.